The Suns beat the Warriors 106-102 on Dec. 15 and will look to do so again Friday in Oakland. As the red-hot Phoenix Suns got a holiday break to reflect on their impressive start, the Golden State Warriors had to get through a Christmas battle to keep their run going. It’s widely considered a big surprise that the Suns are ahead of their Pacific Division rivals with the New Year approaching, and they’ll try to beat the Warriors for the second time in two weeks Friday night at Oracle Arena. Phoenix (17-10) has won eight of nine to move past Golden State (17-13) into second in the Pacific after the Warriors reached the playoffs last season and the Suns finished in last place. This is their best start since opening 18-9 in 2009-10. "We don’t know any different," Phoenix veteran Channing Frye said of his young team. "We like winning." Both teams now seek a fourth straight victory in a matchup which could be keyed by turnovers and 3-point shooting. Golden State has limited its last three opponents to 21.6 percent from beyond the arc and Phoenix has held its past three to 24.1. While the Suns have been off since Monday’s 117-90 rout of the Lakers, the Warriors played a testy Christmas affair in a 105-103 win over the Clippers. Draymond Green was ejected for a flagrant 2 foul on Blake Griffin, who was later tossed for a scuffle with Andrew Bogut after the Warriors center was whistled for a flagrant 1. "At the end of the day, we did what we needed to do to win a basketball game," said Green, who was fined $15,000 for failing to leave the court in a timely manner after his ejection. Coach Mark Jackson was particularly pleased that his team committed only 13 turnovers. The Warriors are among the league’s worst in that category at 17.1 per game and are 7-0 when finishing with fewer than 15. "Feels real good. When we take care of the basketball we are tough to beat," Jackson said. Stephen Curry shot 5 of 17 from the field and is at 32.6 percent during Golden State’s three-game win streak while averaging 15.7 points – nearly eight below his average. However, he’s committed only five turnovers in that span after averaging 5.3 as the Warriors lost four of six even though he scored 30.7 points per game. Golden State is 11-0 when Curry has fewer than three turnovers. "It starts with Steph," Jackson said after Curry had 11 assists Wednesday. "He didn’t have his best shooting night, but did a great job down the stretch making plays. … He was facilitating and not turning over the basketball and that was contagious." 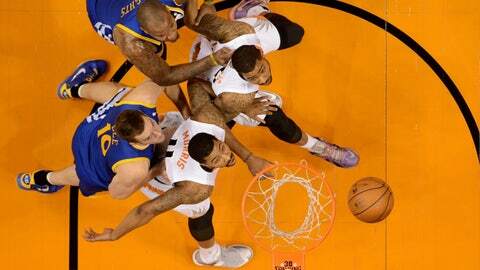 Curry had 30 points at Phoenix on Dec. 15 but committed six of the Warriors’ 20 turnovers in a 106-102 defeat. The Suns had lost the previous six meetings. 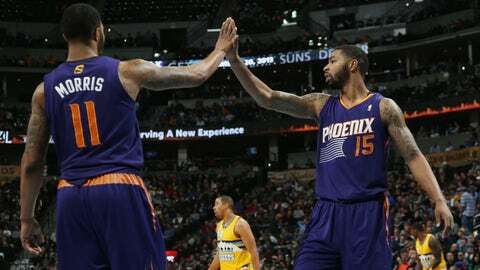 Phoenix’s starting backcourt of Eric Bledsoe and Goran Dragic totaled 45 points, nearly matching the Warriors’ duo of Curry and Thompson (19 points). Dragic has missed all 10 of his 3-point attempts since going 4 for 4 against Golden State, but journeyman Gerald Green has stepped up with 16 3s in the last three games while averaging 21.0 points. "These stretches that he gets on, I don’t know if there’s many guys in the league that can do that," coach Jeff Hornacek said. The Suns have made at least 12 3-pointers in five of the last six games, hitting 45.1 percent and averaging 111.0 points. They’re among the league’s best at 38.4 percent, but Golden State is even better at 40.3. Bogut and David Lee, averaging 25.5 points in the last four games, each have 10 consecutive double-digit rebounding efforts. Suns center Miles Plumlee has averaged 12.6 boards in his past five after grabbing a career-high 20 on Monday.